If you were not a fan of the Chocolate Peanut Butter Cream Pie from last week because you can’t eat chocolate (what other reason would there be) then you’ll love this gluten and dairy free Deep Dish Coconut Cream Pie. It’s just as easy and you will definately get more coconut bang for your buck. This is again another adaptation of Elana Amsterdam’s wonderful recipes. As many of you know I really don’t like long recipes when it comes to baking and Elana doesn’t have any of those. I don’t consider myself a baker but I’m starting to now. Well I have to say that Elana’s Pantry makes such great recipes that even with my shortened baking attention span I can look like a baking rock star. I also have a secret to share. Lean in because I’m only going to whisper this once. Her new Gluten-Free Cupcake Cookbook is on pre-sale for only $9.03. If I were you I’d jump on that like ants to a picnic. You never know when they are going to put that price back up to the regular list price. OK so back to the Coconut Cream Pie. Make sure when you purchase shredded coconut that you look for the highest quality and make sure it doesn’t have added sugar. Organic is great. So first you want to make the crust. 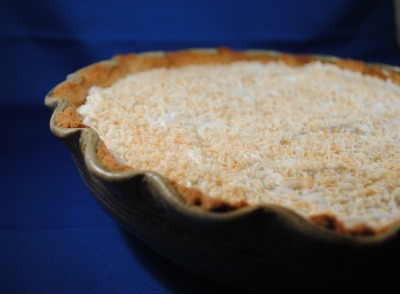 I used the Coconut Pie Crust recipe from Elana’s first cookbook, The Gluten-Free Almond Flour Cookbook. It’s really great as it adds in coconut to the crust and uses coconut oil. I then followed her recipe for Chocolate Cream Pie but I didn’t add in any chocolate. Instead I just kept it vanilla. Now it didn’t set up as firm as the chocolate but it still works great and tastes amazing. I used my deep dish pie plate for this recipe as I wanted to capture every drop of filling and topping. 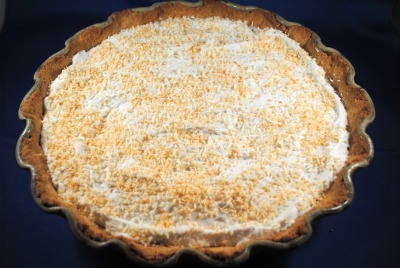 For the topping I added my Coconut Milk Whipped Cream and sprinkled it with toasted coconut. This is my husband’s favorite pie and I was very happy to make it for him for his 50th birthday. I’d offer you a slice but he ate it already. Elana's first cookbook is one of the most used in my kitchen and I certainly got my money's worth on it. I pre-ordered this new one and was just tickled to get it so cheap. I know we're getting a real bargain. Can't to get my gluten-free hands on it. I'm a huge coconut fan and this sounds wonderful. I think the coconut version tops the chocolate peanut butter version for me, but I'll have to try both to decide. =) Love the coconut whipped topping idea. I use coconut milk in so many different ways, but whipped topping is a new one for me. I'm sure it will become a stand-by. I love the looks of your dish — both the actual pie and the deep dish itself. That dish is awesome. I like chocolate, but coconut cream pie trumps chocolate peanut butter for me. I'm just imagining how heavenly this pie is, Diane! Scott made a good call for his birthday dessert. 🙂 Love Elana's recipes and that is an amazing bargain for her new book. I just got it and made her marble cupcakes yesterday–divine! Yum – I LOVE LOVE coconut cream pie. I do not see the recepi! For the coconut cream pie. Maria you need to follow the link to Elana's Pantry where she shares her recipe for Chocolate Cream Pie. Read through this post again. I took out the chocolate an added in fresh coconut. You decide how much you like in the pie and on top. I just tried this recipe, and it didn't set at all! The liquid (after chilling) is the consistency of melted ice cream. How does one avoid/fix this! Christy did you use arrowroot in your recipe? It won't set up without it. Hi There, i did! I followed the recipe exactly. I had problems with both the pie and whipped cream. neither set. In the end, I ended up turning the pie into an ice cream pie, which was delicious, but it wasn't what i wanted. i'm not sure why it went wrong… i used a kitchenaid to make both. Christy the pie filling should have been made on the stove top. You have to heat it in order for the arrowroot to work. Did you take out the water from the coconut milk? Did you also use full fat coconut milk in a can? I did make it on the stove top, and used full fat (milk not cream)… but i don't see anything in the instructions about taking the water out of the coconut milk… where did i miss that? would this have also been the problem with the whipped cream?